In Destiny of an Emperor a value called MTP, or Maximum Tactic Points, determines the number of variously-powered tactics you can use before you must visit an inn to replenish yourself. MTP is nothing new (though it, like many other things, was interesting in a game as old and original as Destiny of an Emperor), but in this game, your final value is variable, and can be affected by your actions. In this article we discuss how to swing this game mechanic to your favor. You start the game with 10 MTP, and each time your party gains a level and a tactician in your party learns a new tactic, your MTP will increase randomly anywhere from three to five points. For every level from 2 to 31 it is possible to learn a new tactic. 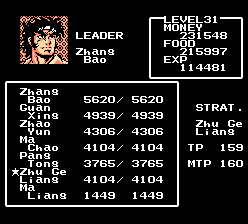 On level 31, the finest strategists in the game learn Ce Mian, the final tactic, and whatever MTP value you are left with at this point will serve as your limit for the remainder of the game. In order to get credit for a tactic, a capable tactician must be in your party at the time of level-up. We will discuss this in greater detail below. Two games (left: James; right: Lord Yuan Shu) played almost exactly the same way. Both resulted in very different MTP values in the end! There are three ways you can affect your final MTP value. Through extra effort, you can also improve your ongoing value as you play through the game. First, the earliest stretch of the game—from Zhang Jao to Yuan Shao—is risky, because you do not have a skilled strategist. Under this circumstance it is easy to miss out on certain tactics as you level, thus reducing your current and final MTP as you play through the game. Second, different tacticians learn different things, especially in later levels. This can result on lost MTP on level-ups. Remedy by keeping two individually skilled strategists around at all times. Finally, third—and this tip is only for the truly dedicated)—because MTP is random, you can affect your MTP value by restarting when you are awarded with three (or if you are very dedicated, four) MTP on a level up. You will eventually get five. Through this stretch of the game it is easy to miss out on a tactic when you receive a level-up. As a solution, move through this part of the game as efficiently as possible. Don’t fight unnecessary battles (including random battles) and continue until Xu Zhe joins your party. Still, don’t relax too much until both Zhuge Liang and Ma Liang join your party. For best results, combine this information with Factor 2 below, which is also suitable for casual gameplay. While each level from 2 to 31 is associated with a tactic, each tactic requires a certain level of intelligence before it can be learned by a tactician. Zhuge Liang, for example, is the only officer in the game that meets the 255 intelligence requirement of the healing tactic Jin Xian. If a capable officer is not in your party when the level-up arrives, you will not learn the associated tactic. Finally, some tactics override other tactics. We’ll spare you the technical details and offer the following instructions. Avoid unnecessary battles whenever possible until Xu Zhe joins your party in Yuan Shao’s territory. Remain vigilant until both Zhuge Liang and Ma Liang join your party, then feel free to go nuts. Keep both in your team on each level-up until you can eventually replace Ma Liang with Zhou Yu (the finest An Sha-capable tactician in the game) or Jiang Wei. If you do this properly you should have a strategist present for every level-up skill but Fu Bing (see The Fu Bing Factor below) which is very hard (and time consuming) to get. Each level-up in which an active tactician in your party earned a level-up nets you a bonus of anywhere from 3 to 5 MTP. No further explanation is necessary. To put it simply, you can reset your game if you don’t get the number you desire, and try again until you do. While it is possible to get a bonus of 5 MTP every level-up until you reach level 32 (see Obtaining Perfection: 160 MTP below) it is extremely time-consuming and pointless for any form of general gameplay. What you can do, however, is save frequently, and observe your level. If you are close, save up around your current castle, and restart if you get three. You can really take it as far as you want from here. For only the most dedicated of fans, the tactic Fu Bing presents a unique challenge. It is the one tactic you have absolutely no chance of getting MTP for in normal gameplay. Learned at level 12, and requiring an intelligence greater than 200, your finest tacticians at this point all fall short—and no matter how hard you try, you will hit level 12 just before Xu Zhe joins you. As pointed out originally by Yan Ying Fu (by email), and later discovered and tested by Scholars of Shen Zhou forum-member MiDKnighT, there is a way! Liu Bei, who meets the intelligence requirement, can learn Fu Bing. 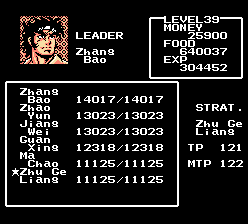 All you have to do is save up to level 12 in the first are before he leaves you, learn Fu Bing (and thus, gain MTP for it)—a daunting task if not playing on an emulator with a fastforward feature. To ensure a good overall total, hire Li Ru as soon as possible in Dong Zhuo’s territory, then battle conservatively until Xu Zhe joins you. Liberate Jingzhou before defeating Yuan Shao to get Zhuge Liang and Ma Liang, and it is clear-sailing from there. Following these steps, while observing the factors above, it is actually possible to get 160 MTP (see Obtaining Perfection: 160 MTP below). If you do not gain 5 MTP on any level between 2 and 31, restart. Your MTP total, at any given point, should always be divisible by five! In the Xu Zhou region, save up to level 12 with Liu Bei in your party. On level 12, when Liu Bei learns Fu Bing, continue with the story. Try to run from unnecessary battles until further notice. Consider hiring Li Ru (Dong Zhuo’s territory) when available. While you do not need him, levels 16 and 17 require Li Ru or Xu Zhe. After defeating Yuan Shu, enter Yuan Shao’s territory to recruit Xu Zhe. Optional if you have Li Ru. Recommended as he is an excellent strategist. Leave Yuan Shao’s territory. Enter and liberate Jingzhou. Recruit Pang Tong and Ma Liang before level 18. Use Li Ru or Xu Zhe until you reach level 17. Before level 18, replace them with Pang Tong and Ma Liang. Defeat Yuan Shao, then recruit Zhuge Liang. Zhuge Liang can replace Pang Tong, but not Ma Liang. Hire Zhou Yu in Wu to replace Ma Liang and Pang Tong. Zhou Yu is optional. He replaces Pang Tong and Ma Liang. Zhou Yu can be replaced with Jiang Wei in Wei, at your option. 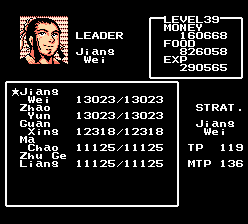 Only Zhuge Liang is necessary for levels 28–31. On level 31, enjoy your new total of 160 MTP!